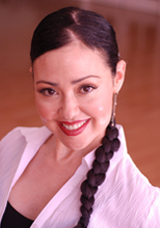 Josie Lopez owns and operates Step by Step Dance Studio. In 1995 she received the top teacher award for the Challenge of Champions. In 2003, and again in 2004 and 2005, Josie was recognized as one of the top three female Teachers in the United States. She hold numerous national and regional Pro-Am dance titles with her students.